As much as I love color and print, chilly grey days often have me reaching for cozy neural colors, and true to form, I'm continuing my end of year boycott of tights. Thankfully over the knee boots provide the perfect solution to staying warm while still getting to don a dress. This month is already flying by, and hopefully this weekend we'll get the tree and then it will really start to feel like Christmas. I still have so much shopping - and wrapping - to do! I also have some lofty baking goals, and just had to talk myself out of spending $10 on a copper reindeer cookie cutter at Williams Sonoma, since I only wanted it for the purpose of being a background element in photos. I decided to be rational and ordered a $1 cutter instead (but split the difference by adding half a dozen other shapes to my cart). Are you ready for the holidays yet? I've finished my holiday shopping and that was my only goal for the season, so I'm feeling on the ball. Except that there is a stack of not yet wrapped presents in my living room that I need to tackle this weekend - the task is beginning to feel increasingly insurmountable as more of the gifts I've ordered arrive. So realistically, I'm not anything like ahead, it's just that I set the bar for accomplishment very low ;) But I have no excuse, since it's gotten so cold here that going out at all, even in multiple layers, feels like madness. I'm envious of your lack of tights and ability to go out with bare hands. I should stop complaining, but winter came on so quickly this year that I didn't even have time to get out my OTK boots before it had already arrived. 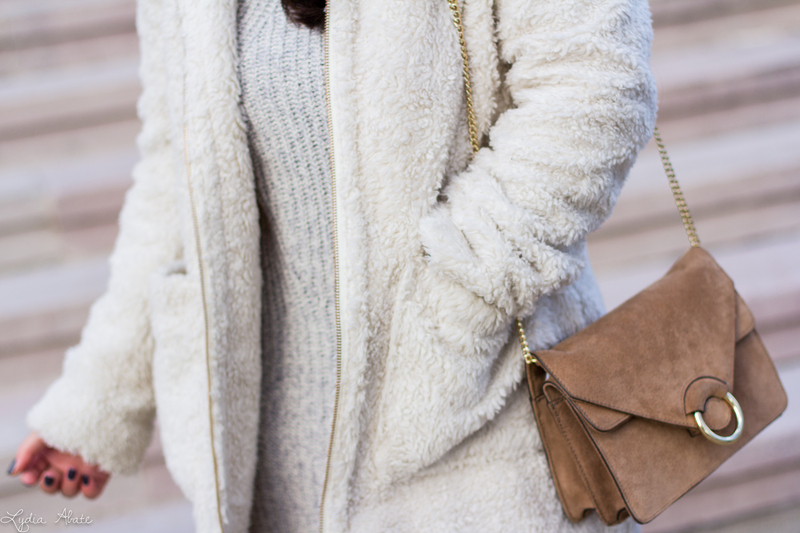 Ooh I love these cozy layered neutrals! I'm on the same track with you for the holidays. I have a long way to go but thankfully Amazon Prime makes most of it pretty easy! Ha! I am definitely not ready for the holidays and can't believe first week of December is already done with. I love this cozy and elegant look. Grey and tan for the win. The dress, coat and earrings are fabulous! I am a neutral lover through and through so this outfit spoke to me! Super chic my love! I love your neutrals! I have been on a red kick for some reason. I have most of my shopping done but no wrapping. All these neutrals look great together! :) I've just finished with writing my Christmas cards and I need to get a move on with wrapping my presents - everything's bought but I find time to wrap tricky to get sometimes as I need the kids to be fast asleep haha. I have so much baking to do for our family cookie exchange and I need to finish my shopping and wrapping. This neutral look is so pretty! Your boots are gorgeous! Yes to neutrals!! Your coat looks so cosy. I like the teddy texture. Great look here! These two shades look so very luxurious together. I am just back from weeks of traveling and have yet to get a tree, set it up and check my shopping list of presents. It's gonna be a very busy weekend. 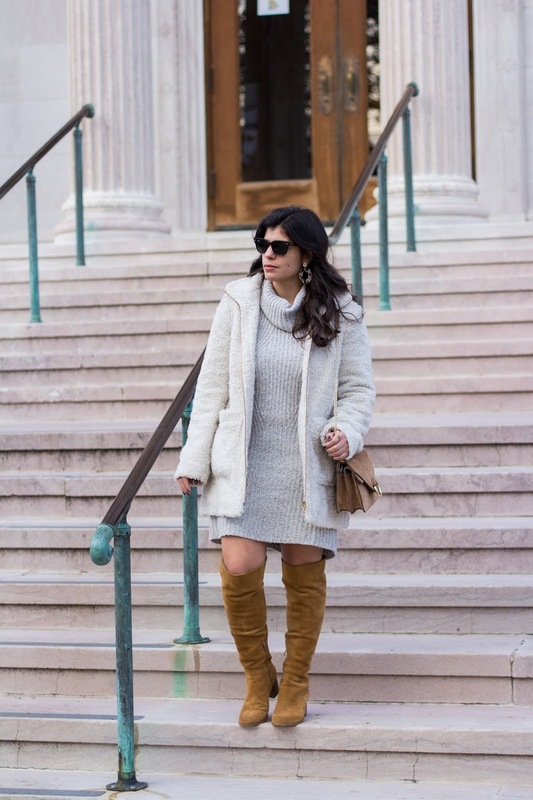 Love those great high boots - they look really cozy paired with your light coloured outfit. And very winter chic. I still have all my holiday baking to do, so that's this weekend's big project. 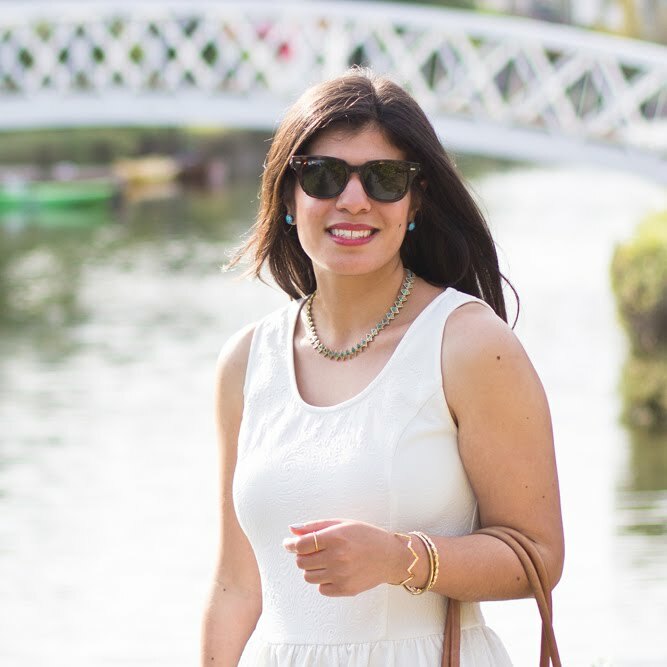 Well, these outfits are simple, timeless and look really amazing on you! That ivory dress is so pretty! I love all these shades of soft neutrals paired together. It's such a chic look! Wow this is just gorgeous. 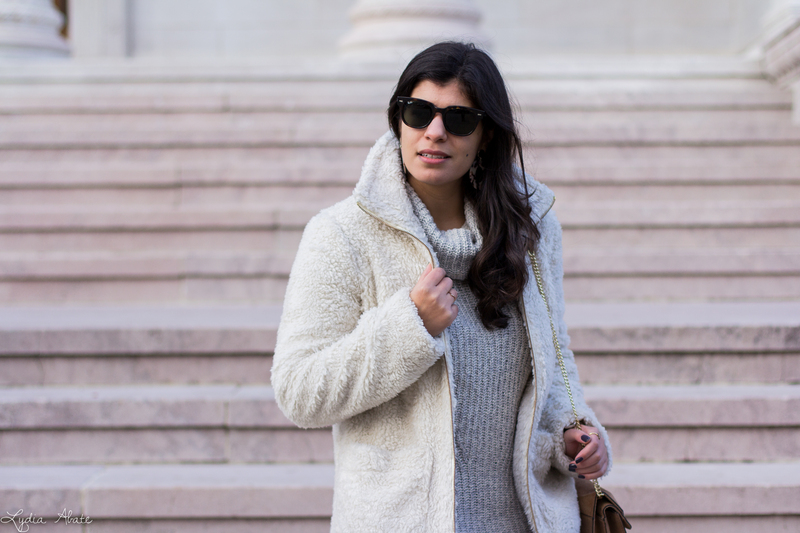 Your coat is so chic and perfect for winter! I am loving your sweater dress and how flattering the shape is. The perfect and coolest outfit for Winter. Look amazing, like it.Thanks for Sharing. 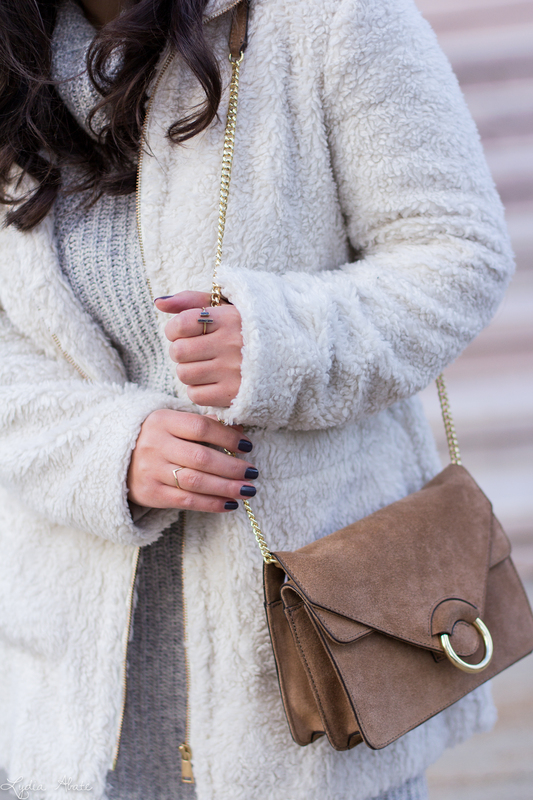 Super cozy and chic! Love the combination of the sweater dress and coat dear, super cozy and comfy. Lovely and warm boots to pair it with too. That sweater dress looks super comfy! I need something like this right now! I gravitate towards neutrals this time of year too. And I also love doing OTK boots instead of tights too, although I have had to do tights a few times already this year, it's been SO cold!! I love that sweater dress! I'm not ready for Christmas. I can't believe the first week of December is over. I like the clothes you wear, giving people a comfortable and elegant feeling. Simple, atmospheric dresses look great.